Every girl needs a great pair of arches…they’re the fastest way to a magical transformation. Natural or polished, there’s no one brow that fits all! So put your best brows forward with Benefit! Never underestimate the power of your brows.. When we say thin & skimpy, we're saying barely there brows. Maybe your hair is blonde or fine...or perhaps you over-tweezed. Benefit have got you! If you wish you had more brow hairs...fake it! Turn those thin & skimpies into a pair of full-figured brow beauties. Try the award winning Gimme Brow Volumizing Eyebrow Gel £18.50. Containing tiny microfibers that adhere to skin & hairs, creating natural-looking fullness and definition. The custom, tiny tapered brush blends easily while the precision tip shapes hairs into place. Now available in 3 shades, including a NEW MEDIUM SHADE, so every gal can brush on fuller-looking brows. Includes signature Tips & Tricks. Tada! Brows come in all shapes & sizes but shapeless doesn’t have to be one of them! Maybe your brow is straight as an arrow or perhaps overgrown, un-groomed hairs have your arches in hiding. Don’t fret…define! Eyebrows are the one thing you can get into shape without exercising. Tame & sculpt shapeless brows into your own arches of triumph, then lock that look for hours of groomed glam. Try the award winning, famous pocket-size Brow Zings Eyebrow Shaping Kit! NEW & improved! Brow zing’s perfectly paired eyebrow powder & wax, mini slant tweezers and new dual-sided extendable applicator is everything you need to sculpt, shape and fill brows. Plus, our signature Tips & Tricks! Available in 3 NEW shades so every gal can get amaZING brows. £24.50. Brows are sisters, not twins but sometimes they don't even look related! Maybe you have bare spots or scars, or perhaps an unfortunate tweezing incident left you with a no-good hole. Time to get even! Make your patchy brows a thing of the past. Fill the gaps from start to end and create natural-looking fullness in a flash. Try the award winning Goof Proof Eyebrow Pencil! Presto…everyone’s an expert with this super easy filling & shaping eyebrow pencil. 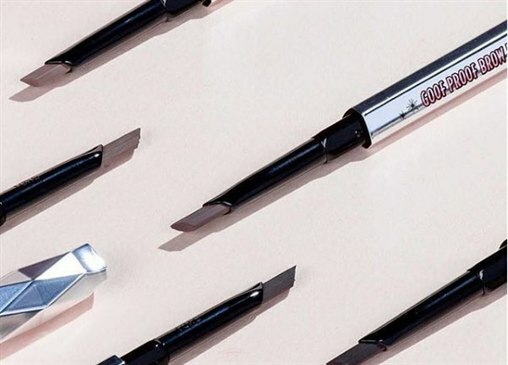 It features a custom, non-sharpen “goof-proof” tip, soft colour and a glide-on formula for easy & fast brow filling. Comes complete with built-in blending spoolie-brush and signature Tips & Tricks! Voila! £18.50. Find more gorgeous products in store at Debenhams!